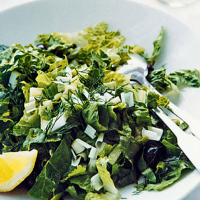 Mix the romaine lettuce in a bowl with the salad onions and dill. Stir the lemon juice into the olive oil and season to taste. Toss the salad in the dressing, scatter with a little extra dill and serve with an extra lemon wedge.